TALLAHASSEE, Fla. — The Florida House and Senate have given final approval to legislation that would increase criminal penalties for people who injure or kill dogs or horses that work with police officers and other first responders. The measure would make it a second-degree felony, up from a third-degree felony, for people who kill or cause great bodily harm to police, fire or search-and-rescue dogs or police horses. The change would boost the amount of potential prison time from five to 15 years. 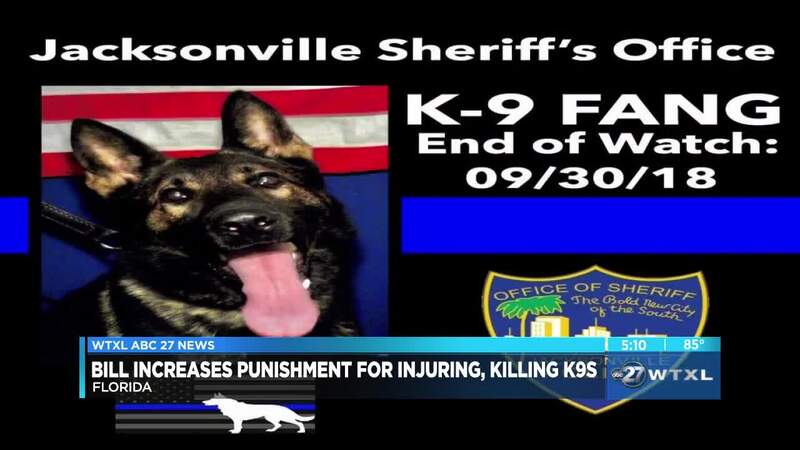 Supporters say the bill stems, at least in part, from the death of Fang, a 3-year-old member of the Jacksonville Sheriff’s Office canine unit shot and killed last September by a teenager fleeing a carjacking. State Senator Tom Wright used to be a police officer assigned to a K9 unit. The legislation now goes to Gov. Ron DeSantis for final approval. © 2019 The News Service of Florida. All rights reserved.